As far as perfume is concerned, the d'Ornano family at the helm of the Sisley brand, have always managed to command the senses with their scented creations. Last year I blogged about the very dynamic Eau de Campagne - a shared scent created in 1974 that is still very relevant and much-loved today. Their subsequent offerings for women aptly named Eau de Soir and Soir de Lune have also been revered by their own adoring audiences. Sisley has gone on to become a name synonymous with grace, sophistication and beauty. 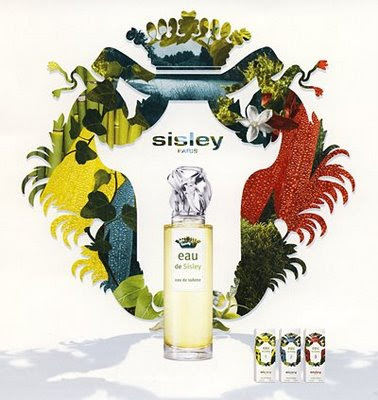 This month, the French aromatics and phytocosmetology giants launch their new trio of fragrances under the Eau de Sisley umbrella... a launch that I have been in keen anticipation of. These new scents, conveniently named 1, 2 and 3, are designed to reflect "three sisters or three different faces of the same woman". To my rational sensibilities, this might be a bit of a reach, but the trio are very likeable regardless of the caffeine-fuelled creative minds responsible for their marketing. No 1 is a soft, joyous floral scent - conspicuously feminine in nature - that combines sun-kissed citruses with jasmine, green tea and a spritz of bitter juniper over a pale musk base. 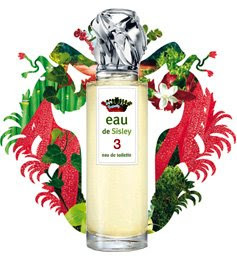 No 2 is reminiscent of Thierry Mugler's Angel Innocent - a scent with an effervescent sparkle and light gourmand quality. The overall feeling is, however, very Sisley in style... restrained, stylish, and edited. The third, No 3, is the eaux that succeeded the most in seizing my attention. A number of years ago whilst attending a fragrance training workshop with Beauté Prestige International, I was handed a canvas, a paintbrush and a palette of watercolours and told to "paint what I smell". The instructor spritzed a number of blotters with a fragrance dispensed from a blue glass flacon that she managed to keep concealed. She handed one of the paper strips to me, looked me in the eye, and said "go". I held the paper strip beneath my nose and my mind instantly blazed with images of Mediterranean garrigue, deep green cyprus pines, whitewashed Greek churches on rocky outcrops, and my hand began to record it all carefully on canvas. Unbeknownst to me at the time, the scent that had served as my inspiration was L'eau Bleue d'Issey. When the exercise was concluded and we were asked to reveal our paintings to the group, I was astonished to see many interpretations of the same theme... bushels of herbs, rugged cliffs overlooking sea vistas, and scrubland dotted with resinous trees - there were even a few more churches! It was an effective exercise in opening ones "inner eye", and transferring that vision to paper. Why the lengthy discourse? I hear you grumble... well, in the moments I sprayed eau de Sisley 3, I had a very similar experience. I was immediately flung into a Mediterranean landscape where clumps of fat, heavy, aromatic citrus fruits hung from bushels of waxy dark green leaves. There was a definite sense of harsh sunlight bearing down from overhead, and the smell of sweet floral nectar floating on the air. So vivid was this mental picture, I couldn't help but fall somewhat for No. 3... a scent based around stimulating citrus, Chinese osmanthus and tangy ginger. What I perhaps I find most interesting about this scent, is that there does exist a harkening back to Issey Miyake's L'eau Bleue d'Issey here... the ginger note at the heart of this scent sits over an aromatic base of patchouli, vetiver and pale musks. This combination renders 3 a possible favourite with men, as much as I imagine it will appeal to the women. I think perhaps here, I see a common "red thread" linking back to Sisley's Eau de Campagne. Where the Campagne is verdant, sharp and vivifying - something to be worn at a lavish retreat or country club spa - eau de Sisley 3 maintains a sense of nobility but in a more relaxed manner. One could appreciate this eaux reading a literary classic whilst lazing in a hammock overlooking the Aegean, or strolling the chic streets of Cannes in the summertime whilst the paparazzi swell in numbers around you. I am certain many will find a new favourite for 2009 amongst these three fine fragrances. Their appeal will match people both young and mature, and irrespective of gender. The eau de Sisley trinity are currently being sold in 100ml sizes for approximately $160 USD - something of a small investment - but one that is on par with many other refined, sophisticated releases on the market.